Afghan security police patrol near the cemetery, where victim of Friday's suicide attack at the Shiite mosque were buried, in Kabul, Afghanistan on October 21. It was the second suicide attack in the Afghan capital in 24 hours and the seventh major assault in Afghanistan since Tuesday, taking the total death toll to more than 200, with hundreds more wounded. The spate of deadly attacks underscores deteriorating security across the war-torn country. On Friday, suicide bombers struck two mosques in Afghanistan during Friday prayers, a Shiite mosque in Kabul and a Sunni mosque in western Ghor province, killing at least 72 people. 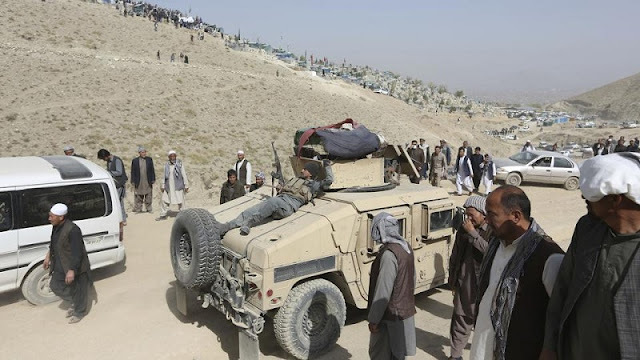 Earlier in the week, overnight on Wednesday and into Thursday,Taliban killed at least 58 Afghan security forces, including an assault that nearly wiped out an army camp in southern Kandahar province. A suicide bomber killed 15 Afghan army trainees as they were leaving their base in Kabul on Saturday, the defence ministry said, in the latest deadly attack in the capital. “This afternoon when a minibus carrying army cadets was coming out of the military academy, a suicide bomber on foot targeted them, martyring 15 and wounding four,” defence ministry spokesman Dawlat Waziri told AFP.